Santa Maria al Bagno (or formerly Bagni di Santa Maria) has its own page. Salerno - is a city and comune in Campania (southwestern Italy) and is the capital of the province of the same name. It is located on the Gulf of Salerno on the Tyrrhenian Sea. In September 1943, during World War II, Salerno was the scene of Operation Avalanche, the invasion of Italy launched by the Allies of World War II, and suffered a great deal of damage. 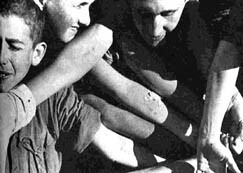 3) Any information about a DP camp in Italy in a place called Villa Caracenni or Villa Cartina, where Kibbutz Ha-noâ•?ar Hatzioni (the "Zionist Youth Kibbutz") existed. # Collection of Italian Military Records, 1935-1943. Microfilm Publication T821. 514 rolls. Finding aid: Guide to Records of the Italian Armed Forces, Parts I-III (National Archives, Maryland 1967). Also available as Microfilm Publication T94, 1 roll. # Personal Papers of Benito Mussolini, Together with Some Official Records of the Italian Foreign Office and the Ministry of Culture, 1922-1944. Microfilm Publication T586. 318 rolls. (Finding aid: roll 1; see also Microfilm Publication T120). UKRAINIANS IN ITALY Svitlo (Light): orhan tovarystva "Prosvita". Ch.11946; ch.1,2, 1947. TUP-Rimini, Italiia. 32tsm. Language-Ukrainian. Rimini-Italiia, 1946,1947. Zhyttia v Tabori (Life in Camp): ukrains'kyi shodennyk,rikII, ch.109, 112, 113, 1946. Rimini, Italiia. Tabor Ukrains'kykh Polonenykh. 31tsm. Language-Ukrainian. Rimini, Italiia, 1946. Iunats'kyi zryv: Hazeta (gazette) Kurenia Molodi (youth). Ch.45,6,7, 1945; ch.2,3,4,8, 1946; ch.1, 1947. 31tsm. Language-Ukrainian. Rimini, Italiia, 1945-1947.